Assists resellers of credit report data in assessing the security of the data they furnish. Provides On-site Verification of physical location and operation of end users of credit report data. Satisfies Credit Bureau, FCRA, GLBA and DFA requirements to verify security measures being used to protect consumer data. Conducts professional observations and photographic reinforcement provided by vetted, well-trained inspectors. Performs intuitive, industry-specific quality review process. The fastest, most effective and thorough way to for the reseller to obtain such verification is to hire Metro Inspections, an unbiased, third-party inspection provider with an understanding of the industry-specific concerns and a national network of well-trained, vetted professional inspectors. Metro Inspections will assign an inspector to visit the business location and make several observations about how the business obtains, stores, and destroys consumer information. Metro Inspections will then analyze, scrutinize, and compile the results in order to submit them to the reseller through our state-of-the-art Inspection Management System. The reseller is then able to assess the findings as they make final determina-tion on the approval of the business’s application to become an approved provider of credit data. This level of customization creates as seamless experience as possible for the payments provider, freeing up time and attention to focus on other priorities rather than micromanaging their inspection vendor. Given the demanding schedule of the risk management and credit professionals who rely on our services, we understand the necessity for quick, constant, efficient communication. 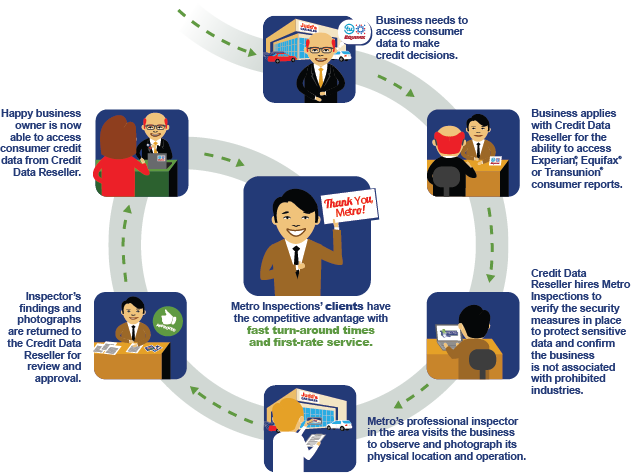 A key element of Metro Inspections’ business model is responsiveness. Any client communications, whether they be general in nature or specific to an inspection order, are addressed immediately and a resolution communicated promptly upon its finding. Our Clients have direct access to our Inspection Coordinator team via telephone, email and online messaging for instances regarding specific inspection orders. In addition, a Relationship Manager is assigned at Metro Inspections to work directly with a specific designee to ensure that all preferences are kept up-to-date as well as to resolve any issues or concerns that may arise regarding the terms of the partnership. In addition, Metro Inspections’ Relationship Managers are issue-resolution experts. As such, they are included in all communication regarding any escalated situations, and, in many cases, will get involved to ensure a speedy resolution of the issue.